Two days before the Spring Lantern Festival. The temperature had warmed up again. The snow in the courtyard had gradually started to melt and disappear. The flower buds in front of the door were noticeably vivid. Spring was approaching. Wei Luo didn’t like people waiting by her side when she was bathing. She would always send Jin Lu and Bai Lan outside and slowly take a bath by herself. At this moment, she was standing in front of the bath barrel and feeling troubled. She looked at the pink dudou embroidered with golden tree peony flowers that she was holding in her left hand. She had tried putting it on several times. She knew how put it on, but wearing it felt painful. At the beginning of the year, she had just turned thirteen. This was period that young girls started growing and developing. The two small peaches on her chest felt sorer each day. As they swelled, she would hiss even if they was gently touched by clothing, especially the tips of the two small red beans. When they ached, everything they touched felt rough and harsh. After she put on the dudou, the chaffing from the cloth felt painful and weird. If she didn’t have to go the fourth branch’s courtyard to meet fourth aunt soon, she really didn’t want to want to put on the dudou. Jin Lu called out again from outside. Wei Luo frowned in annoyance. Her only choice was to tolerate the discomfort and put on the dudou for now. Then, she called Jin Lu inside to help her put on the rest of her clothes. Jin Lu’s head was lowered as she walked out from behind the divider screen. She didn’t dare look at Wei Luo’s body too much. She was afraid that if she did, it would become a habit. Her eyes and nose focused on picking up the clothing. Despite her efforts, as she served Wei Luo with putting on her clothing, she inevitably touched that delicate and flawless skin. Her exquisitely made skin was pure and smooth. It seduced people to enjoy themselves and linger. Wei Luo changed into a pink jacket filled with wild goose feathers. Beneath it, there was moon white cascading skirt. On the outside, she had a cloak that was embroidered with cherry blossomed colored tree peony flowers. Originally, she didn’t like to bathe during the day. But, she had a dream last night. When she woke up, she was soaked in sweat. She felt uncomfortable and took advantage of the early morning to take a bath. Bai Lan was carrying a food box in the front and leading the way. She had following Wei Luo for four or five years and was now entirely in her element inside the residence. She was no longer that overcautious and nervous girl that had just arrived at Duke Ying’s residence. Because she knew what Wei Chang Mi would look like when he grew up, Ah Luo really couldn’t accept the affection he had towards her. She would always involuntarily substitute his current face with the one that he had as an adult. When she thought of that wild and unrestraint person, she would abruptly have a bad feeling and tremble when Wei Chang Mi hugged her. Wei Luo poked his forehead a few times. At such a young age, he already knew how to say sweet words to coax a girl into happiness. No wonder, he became an excessively promiscuous romantic when he grew up. Although her body was sweet smelling, it definitely wasn’t as exaggerated as he described. When she was bathing before, she had used two drops of rose dew made by Han-shi in hopes that after her bath, she would give off a faint fragrance. Only a person that was very close to her body would be able to smell it. He must have heard the sound of her footsteps and known that she had come. “Chang Mi, you’re saying nonsense to your fourth elder sister again.” Qin-shi had a small enamel hand warmer concealed in her hand. She was wearing a light yellow robe with a dark four-season pattern of begonia flowers and grapes. She smiled while sitting on an ironwood arhat couch. As she said this, she opened the box. There were four small exquisite pastries inside. 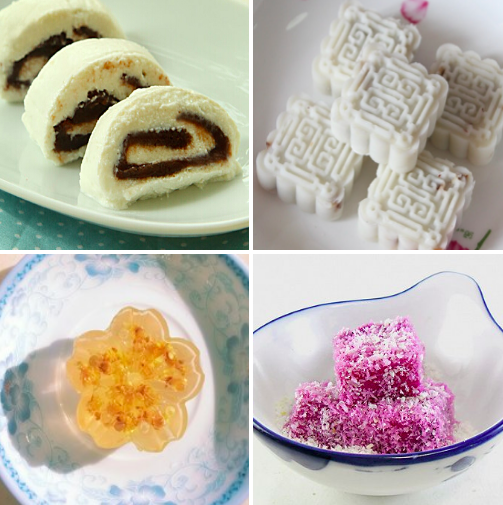 There was a cake roll made with soy beans and filled with red bean paste, yam pastry with jujube paste, osmanthus flower pastry, and icy dragon fruit cake. These four pastry types from Yuhe’s were well known. Although the pastries’ ingredients were common, their taste was exceptional. Qin-shi picked up a piece of icy dragon fruit cake. When it entered her mouth, it was ice cold. When this was eaten during winter, it would usually cause the entire body to quiver. But when she placed it in her mouth to eat, it quickly melted. The milky and fruity taste filled her mouth and made her want to eat more of it. As she fed Chang Mi a piece, she regretfully sighed, “Chang Hong is so thoughtful towards you. You two have such an admirable, close sibling relationship. But…” When she had said half of her sentence, she looked at Chang Mi and her eyes showed a complicated emotion. Wei Luo knew what she wanted to say. Her relationship with Chang Hong was good. In contrast, Wei Zheng and Wei Chang Mi’s relationship with each other was truly awful. As soon as Wei Chang Mi saw Wei Zheng, he would subconsciously reject her. He wasn’t warm or emotional toward her. As soon as Wei Zheng saw him, she would become angry and not have a pleasant attitude. This older sister and younger brother’s relationship continued to worse by the day. By now, it was at the point where they both mutually disregard the other. However, Wei Luo didn’t think there was anything wrong with this. Wei Chang Mi was raised in the fourth branch’s household. At the beginning of the year, he was formally adopted to be fourth madam’s son. It was normal that he wouldn’t be close to Wei Zheng. After all, he usually didn’t have much contact with Wei Zheng. Every day, he was with fourth madam and third elder brother, Wei Chang Xian. It went without saying which people he would be close to and which people he would be distant with. Du-shi had rushed over to the ancestral hall from Gingko Courtyard the day that Wei Chang Mi was formally adopted by Qin-shi. As Du-shi hugged him, she was so sad that she wanted to die. She persisted in her denial. Wei Chang Mi trembled in her arms. As he struggled, he called out “mother” to Qin-shi. This “mother” was a fatal blow towards Dui-shi. It was because every time that Du-shi saw him, he had never called her mother. He would only follow Wei Luo in calling her madam. Later, Wei Kun had people take her back to her courtyard. She had lost her mind. Her gaze was empty when she looked at Wei Chang Mi as if someone had cut off a piece of her flesh while she was still alive. Her chest felt as if it were dripping blood from that wound. There was only despair and hopelessness left. If you thought about it, this was normal. Other than that Qin-shi didn’t give birth to Chang Mi, she had done everything that a mother should do. She had loved him dearly and taken care of him in every possible way. And Du-shi? Every time she saw Chang Mi, she would only cry and complain. She would cry and say malicious words about Qin-shi and Wei Luo. In the end, she would scare Chang Mi to the point that he would wail with her. The fact that Wei Chang Mi called Qin-shi his mother, but not her wasn’t the slightest bit outrageous. He was so young and he already differentiated between beauty and ugly. It really made her worry what he would be like when he grew up.